What do you do with a person who has terribly hurt another human being? You kill them of course, at least that’s what Alex Craft feels. Alex Craft has always been different, but when her sister is taken, raped, and brutally murdered, Alex truly becomes the town’s social pariah. She is now the sister of the girl who was raped and murdered. She is Anna Craft’s sister. She is the odd one, but when senior year rolls around, Alex makes a couple of new friends and the town almost begins to see her in a new light.Almost. A best friend, a friend, a new future ahead – nothing could possibly go wrong. The Female of the Species is told through revolving perspectives, and McGinnis integrates these viewpoints seamlessly as the different personalities reflect on the events in their own voice. As the novel progresses, it is evident through their respective chapters that each character is allowing events to change them and help them grow and learn from one another. As such, once the climax is reached, action and inaction go a long way in explaining each character’s reasoning and resolve at the story’s end. Though the character-types are not universal, it is still possible to find one’s own thoughts and beliefs exemplified within the characters of this novel. Having grown up with a truly ignorant perspective of human and female rights, recent events have brought out the feminist in me, which is why I chose to read this book. It is refreshing to have right-minded young men and women represented in this novel, and one could only hope that real-life young adults share the same perspectives as McGinnis’ characters – though maybe not every exact action of the main character. 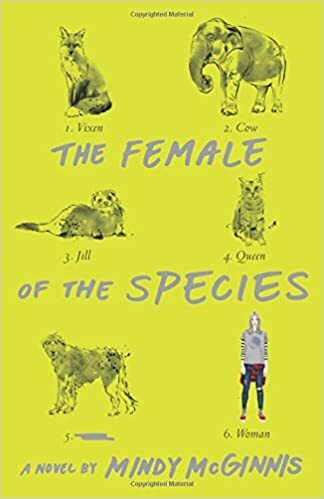 In Female of the Species, seemingly typical teenage situations and moments are given a fresh, new twist in this novel. Just when you can sniff the 90s teen Rom-Com coming up, McGinnis snatches it away and serves you a plate of raw, brutal honesty that makes you face the reality behind current gender issues. Additionally, McGinnis gives a great reflection on the complexity of female relationships/friendships and their ability to band together or make amends despite their differences. While some (minuscule/insignificant) aspects of The Female of the Species were not to my personal liking, I think McGinnis’ work is exemplary in bringing about a fresh, non-run-of-the-mill story for young adult readers to consume. For this reason, The Female of the Species is a book that I recommend to any reader, regardless of age or gender.